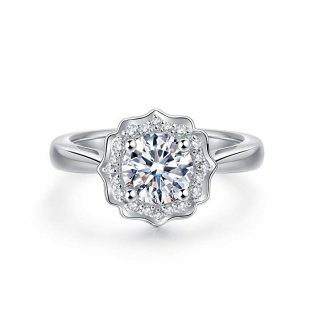 The Most Romantic Selection of Flower Engagement Rings for You to Choose From! 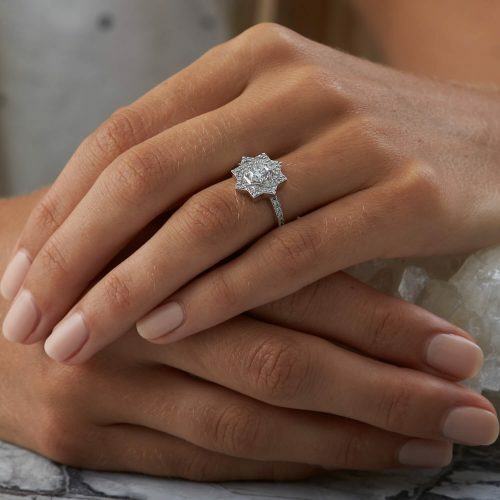 If you’ve been searching for the perfect engagement ring for your partner or even personally for yourself, we have gathered 10 of the best engagement rings you can wear. We love them because they easily meet our 2 requirements for engagement rings. Their designs are gorgeous and feminine, while at the same time, they’re all more than durable enough to handle wear indefinitely. And from our point of view, the word “Indefinite” pretty much sums up weddings (love particularly). So these rings were practically created for the job. 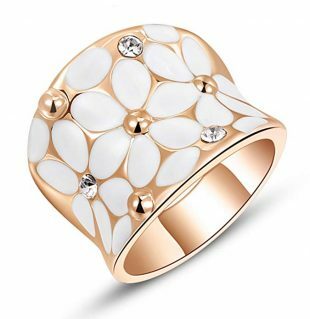 The Newshe Flower band is certainly quite the looker. The ring has that vintage vibe going for it, but it’s the design that we particularly noticed. As you may or may not know, the ring comes in a set of 2. The smaller ring is the choice for the engagement while the bigger one is the wedding piece. Well, according to tradition at the least (you’re free to use it anyhow you want). When you combine the pair, the ring turns into an intricate pattern, not unlike a nest of thorns. 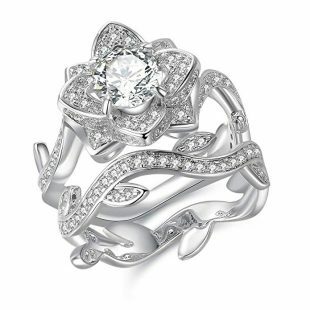 Only, the thorns here are the 3A grade Cubic Zirconia, while the branches are made from Sterling silver. 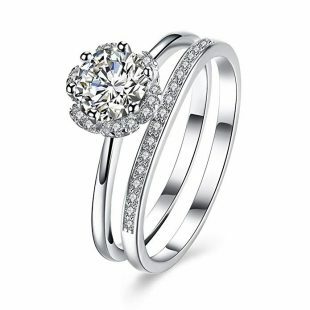 For the CZ used, you can expect 90 pcs of the stone running along the sides of the ring, while 44 pcs complements the pave setting. In the center of all of this is a round-cut 6.5*6.5 mm 1 carat stone, being the cause for attention as usual. It’s definitely a pretty sight, but just wait till you wear it. Each piece is comfortable and they come in different sizes which are actually true to life. For Sterling silver, on the other hand, you can expect a good level of resistance to wear. This ring is going to fit in well, into the role of being used for a really long time. Note: It fits in well inside a jewelry box as well—which is always nice to see. Should make proposing far easier if it applies to you. The use of Cubic Zirconia is really kept to the barest minimum here. Metal Factory used the Maile leaf as a template for the design. Or better yet, let’s say the total design of the Maile leaf uses Sterling silver as the only material. Exception is the CZ at the center of the leaf. In terms of looks, you have one of the better designs out there since it’s absolutely minimalistic in nature. We think this will be perfect for your partner if she’s the type who doesn’t do well with flashy things. Maybe she’s the inconspicuous, shy type, who doesn’t appreciate the eyes coming her way. Now, here’s what we think of this; your partner will appreciate the gift simply because you put a lot of thought behind it. You got her a piece that took into consideration her thoughts on fashion wear. Underneath that line, you should notice that engagements are synonymous with joy. So it’s double the effect for you if you can do it the right way. With those points mentioned, we want to say that the ring comes in the cutest of gift boxes. It makes the process a lot easier for you to pull off, as you’ll know that you’re not alone. With this ring by Imagine Products, you get a band made from Sterling silver, with 5A CZ stones (Marquise and round cut) arranged along the curve. 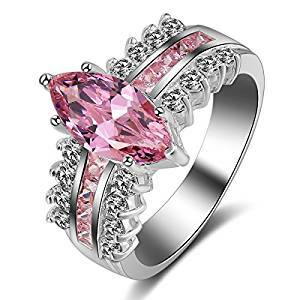 Now, the highlight of this ring is not due to the band being made of 925 Sterling silver nor because the CZ embedded on the ring has a 5A rating. No, it’s simply due to the price of the ring itself. You get quality in the form of both of the materials we mentioned above. In the case of the 5A CZ used, the rating means the stones score a considerable 8.5 compared to a 10 from diamonds. That means it isn’t scratching easily just because she’s wearing it for the occasion. At the same time, Sterling silver is really popular for resisting wear as well—so seeing it combine so well with CZ to form a ring is something we always welcome. That said, let’s move on to the design. 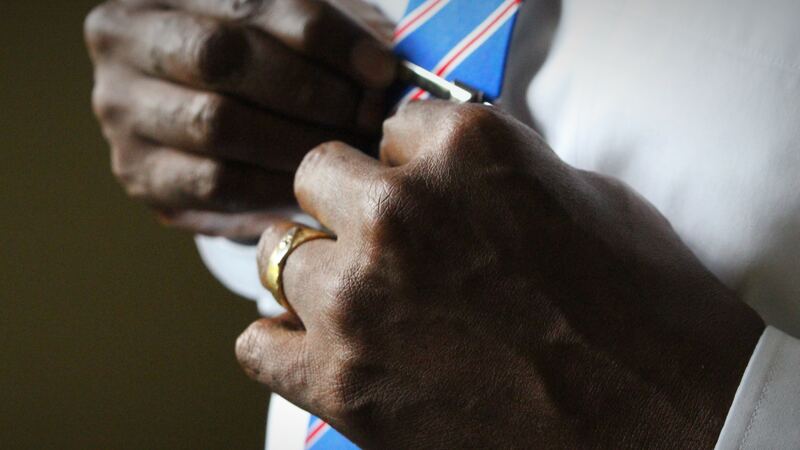 The ring looks bold and authoritative—with a professional vibe to it. It will attract attention, but it’s the good kind that says she’s already taken. We’re guessing that’s the feeling you’re going for. Good luck! The Mytys piece is actually our favorite on the list. Instead of using a design that’s just averagely reminiscent of a flower in most cases, the maker went all out with the details. 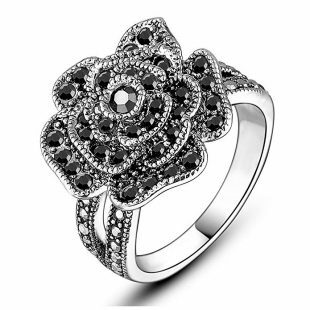 The design here is a black rose—wherein the petals which actually make up the rose are black Marcasite stones. This contrasts nicely with the silver or gold hue (it’s your choice which one) that the ring itself is made from. With this type of ring, and if you’re planning an engagement, we would like to say that it’ll definitely make a statement. The level of quality shown off here isn’t usually associated with such a price point. We personally think the maker’s decision to use silver or gold electroplating was the key to the success. Nevertheless, let’s not get ahead of ourselves too much. The ring should be given to a bold partner. If you don’t see your wife-to-be appreciating the attention people kind of gives such rings, we don’t think it’s the best choice to go for. But if your partner is artistic by nature, here’s a great option to consider. Like the Mytys ring above, this one also uses a flower (a blooming lotus to be more specific) as a template. Like that one also, the level of details you’ll find is simply awesome. My Jewelry Passion spent a lot of time designing the ring and it shows in the type of materials used and their arrangement. For example, the inside of the lotus (the petals), you’ll find a big center stone or to be more specific, 1 carat of CZ. It’s the highlight of the ring actually, and we think that your partner will love it if she’s a romantic. 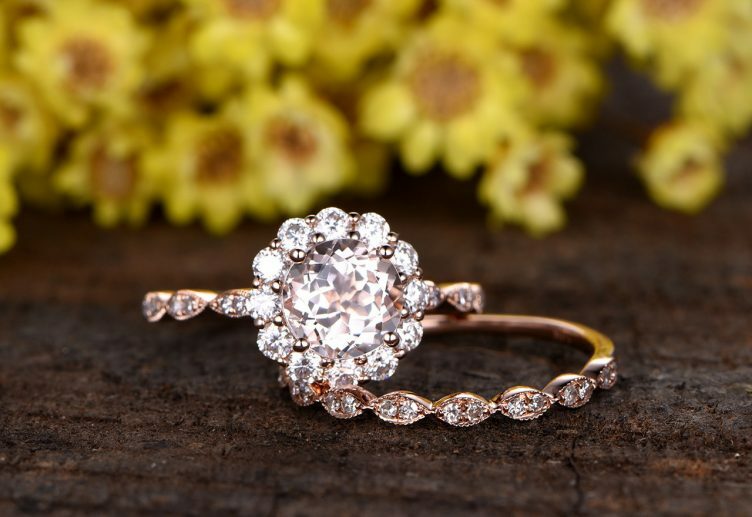 Moving on, you’ll find tiny CZ stones surrounding the center stone to create one of the most mesmerizing pieces you can buy. “It’s built to make a statement”, was the best sentence that we could come up with. Still, while we find plenty of fun, evaluation how pretty a ring or necklace is, we don’t like ignoring the build quality. Fortunately, it performs well in this department; the stones are rooted and won’t be popping out anytime soon. And at the same time, it easily resists scratches in its own ways through the use of 18K white gold plating. That gives it a lot of strength against wear till the wedding and a long way after. Who should you give this to? 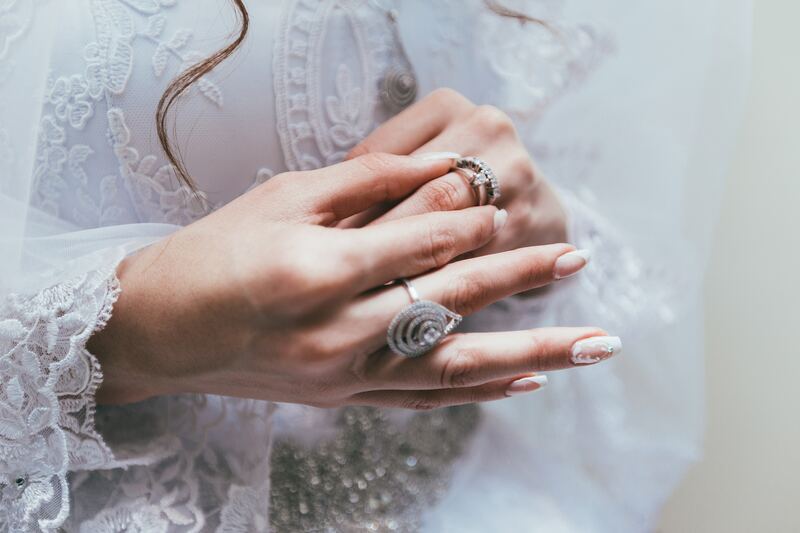 If you have a woman who you think would absolutely love a ring that brings along sheer aesthetic appeal at a cost-friendly price, this is the option we recommend. This is another option on the list that keeps the design as simple as possible, whilst still making a point. It’s for those women who’re professional and so, do not fancy shiny/flashy jewelry and clothes. In other words, if your partner is the serious type, here’s what you should put on her finger. 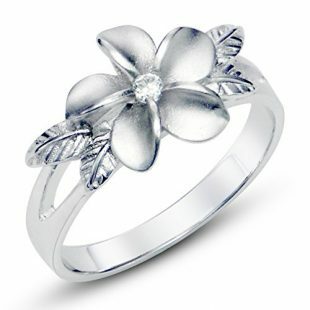 The ring itself is made from Sterling silver and designed as a daisy with 5 petals on top. 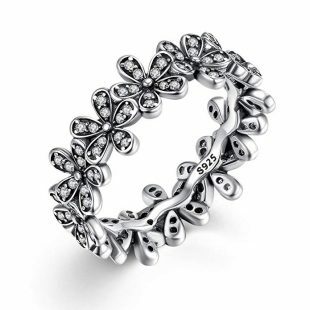 Each of those petals has 2 CZ stones embedded in a row formation to bring out the design. The result of both these things is that you get a ring with great build quality and great aesthetic appeal. ow we see you applying both of these is actually pretty straightforward. The durability comes into play the more she uses it since there’ll be a lack of scratch on the thing. At the same time, it’ll do its part in telling people that she’s already taken. 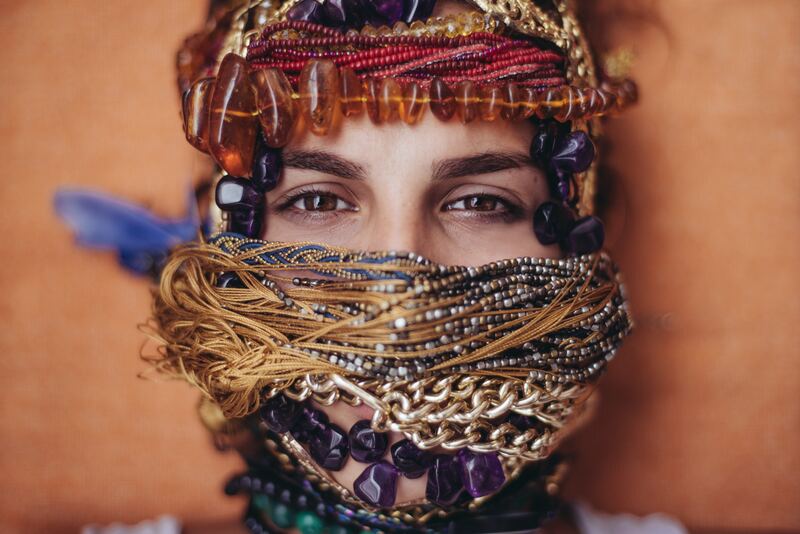 Other than that, the ring is fashionable, or might we say, versatile. 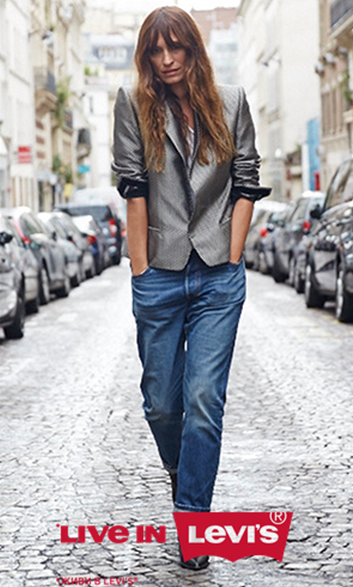 Easy to combine with practically any of the items in her wardrobe. It won’t come as a surprise that BAMOER is behind this piece when you see the design. Like the one above, it makes use of a daisy. But instead of a single one, we have about 10-12 daisies joined together by the same band. 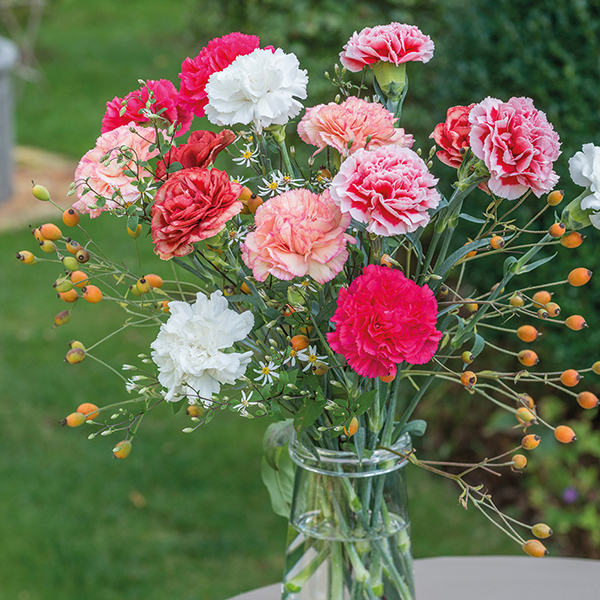 Each flower (their petals specifically) sit side-by-side, so, the design is quite easy on the eyes despite its simplicity. That said, the build is also a highlight of the ring. Like most jewelry that you know at this price point, Sterling silver is the choice in metals. And that means the ring brings along durability against wear. It’ll be needed since it’s after all, an engagement ring. At this point, you need a ring that’ll easily keep up till the date and even then some years after. At that point, you would have created a lot of memories together, so it easily creeps into the family heirloom territory. With everything said now, there is still one drawback to all of this. The ring doesn’t come in a gift box, which would have made the engagement a lot easier. Instead, it comes in a tiny jewelry pouch so you’ll have to buy the box itself. Regardless of which one you’re here for, the BALANSOHO ring is perfect for both engagements and weddings. But for now, let’s focus on its use as an engagement piece. The first thing that comes to mind with that thought is, as usual, the design. This particular ring comes in a set of 2, and the highlight is the fact that there’s a ring each for the engagement and wedding. 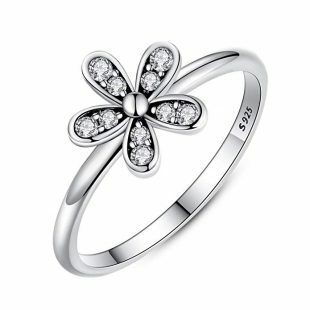 For the first piece, you have a simple band of 925 Sterling silver and the only CZ can be found in the rose-like design. That is, there’s a 9 * 9 mm round cut stone within the 5-prong set while 10 smaller CZ stones surround it. On the hand of the secondary ring, you’ll find 16 CZ stones paving the surface of the ring. 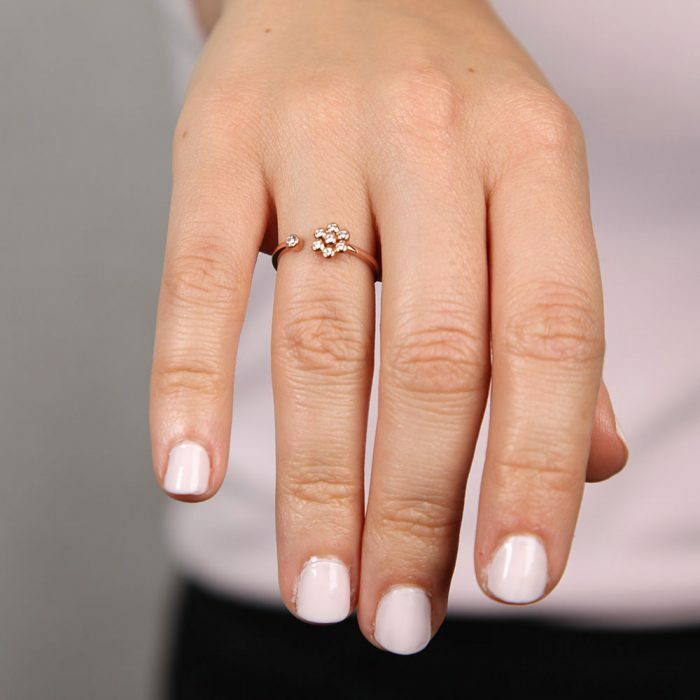 They both combine to form one of the most simple but gorgeous rings that we’ve reviewed so far. Your partner will definitely love the design since it gives off a romantic vibe that’ll hit home rather well. What we see here is one of the better items that easily shows how much you love your partner. So far, there hasn’t been any ring that has quite mastered the use of CZ as Hafeez Center. It has one of the most beautiful designs you’ll ever find in any ring. And all because it’s based on a flower. The ring’s use in simulated diamonds is rather simple. 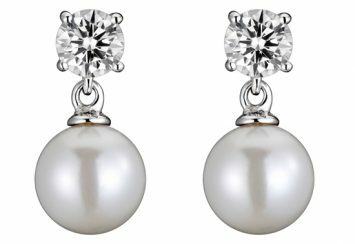 It contains a single 4 prong 5A grade CZ and around it, you’ll find 12 pcs of CZ with the same rating. Now, here’s where things get interesting. While the piece in its entirety is made from 925 stamped Sterling silver, it’s also plated with rhodium to increase the aesthetic appeal and durability. Rhodium is a complement to the silvery hue of Sterling silver so both go nicely together with the white stones embedded at the center of the ring. The end result of both of these elements is a ring that we find perfect for every woman on the team. It looks feminine in a way that matters—whilst sparing you the usual excessive use of stones. At the same time, it does carry your love and we think it’s the perfect ring for the job. Fashion Month adds a spin to the list with their innovative design that involves printed white petals and 3 Swarovski crystals (known as Austrian crystals too). The design sits down on a 3-time rose gold plated surface which in simpler words, means that the ring has 3 surfaces of gold on top to stand the test of time. Due to all of this, applying the ring is actually very easy due to the unique design. 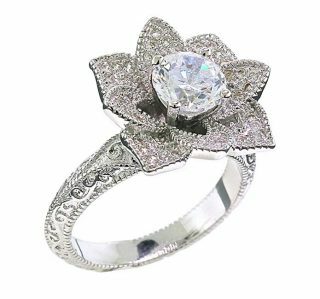 You can consider it one of those rings which are good looking without relying on the help of an excessive number of diamond simulations. So give it to your partner, knowing the ring represents femininity and most importantly, your love. Both are 2 competitors in the game, but we’re sure the latter will win at the end of each round. As usual, you can expect good build quality from this piece also—though we like to say you shouldn’t push your luck too much. To that, this ring is what we consider great temporary ring, but a good performer (not exceptional like the ones above) when it comes to permanent use. Do they have a particular meaning? 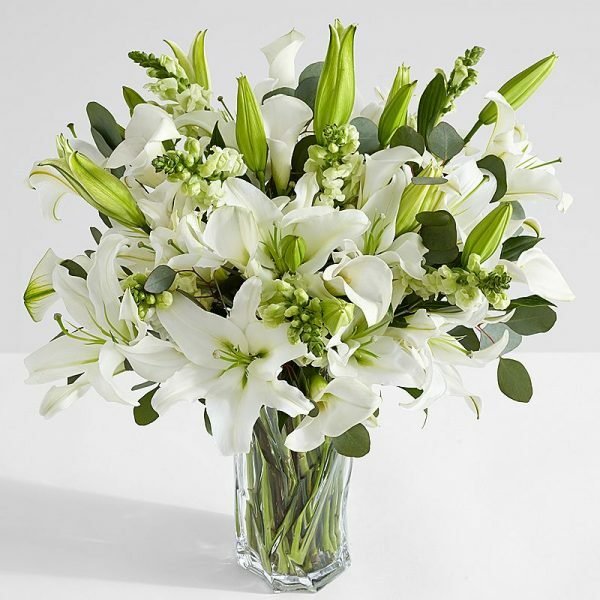 During Queen Victoria’s era, flower became synonymous with love and a lot of other emotions to both men and women. The gift will obviously be given by the man to the woman. Still, at the time, certain flower started being synonymous with very specific definitions. Roses can mean a lot of things and we think everything can be applied to your special woman. For instance, a rose is a symbol of immortal beauty and love, which are 2 things any woman would want to be associated with. Still, this is just one definition. Depending on the color, the meaning also changes. For pink roses, that means healing and innocence, which makes rose rings perfect for hour daughter. Yellow roses represent joy and protection while white roses mean purity. All of this definition, as we said, should be applied to any of the rings above with a gift card. None of them are limited to a particular hue, so you’re free to choose. The meaning of a daisy is a little more possessive. Calling your partner a daisy is essentially telling her she’s the most amazing girl in the world. That goes for her looks, personality, and everyone else in between. The first one doesn’t need to be explained, but the second one deserves one. Personality-wise, a daisy is a girl who always has your back. She’s loyal, smart, and carries a lot of positivity around that’s also very contagious. If this point of view agrees with how you see your girl, there’s a ring up there that uses a daisy as its design template. What are the go-to flowers for engagements and weddings? While there are flowers that carry bad meanings, a lot of them have splendid definitions that you can apply. Think of it as adding your personal touch to both occasions. Anemone is red like roses, though with a very different meaning. The flower symbolizes anticipation and we think it’s the right option weddings if you’re trying to show how excited you are. 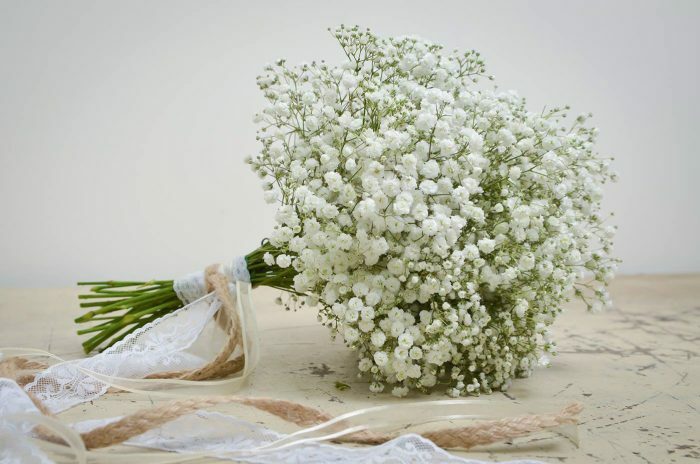 Baby’s Breath is a really popular flower due to its meaning which can be applied in different settings and occasions. The flower means festivity and we think it’s the best option to represent the moment. This is particularly related to determination, pride, and radiant beauty. Like the one above, this is another flower that’ll do well in complementing your partner as all 3 meanings are quite lovely. Here’s the flower that stands for regal. You can apply it to either yourself or your partner. Creates a nice sight if you combine it well with Baby’s Breath. Anthurium is a flower that’s actually not necessarily meant to compliment the bride. The flower means hospitality and that can extend to the guests too—not only your wife-to-be. There are other meanings as well, such as good luck and protection. This flower has 3 colors for you to note. 2 out of the 3 are nice meanings but the last one should be completely avoided. To that, we have the pink option which means gratitude while the white means pure love. The last color is striped and it means refusal—which carries a rather negative vibe. How to clean engagement rings? 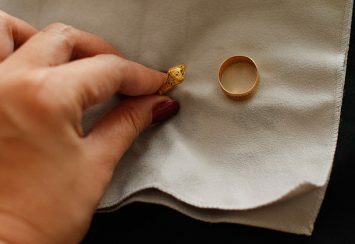 If the jewelry has collected some dust or maybe a few cosmetics, we have a simple solution for cleaning the ring. All you need is warm water, soap, and a toothbrush. In that same order, you use the formula to clean the ring of any impurities. Now, the advantage of using this method is that it’s very safe for most, if not all of your jewelry. At the same time, you save up on cost as you won’t need to visit a jeweler or even come up with washing formula at home. Provided of course, that you do this regularly. How regular should I clean it? If you really want to maintain your engagement’s ring indefinitely, show it some love by cleaning it every week. Just follow the same formula above for it, or just buy an ultrasonic jewelry cleaner if you’re planning on cleaning a lot of jewelry. If you’re interested in the latter but you need a bit of support, then consider the cleaner as a long-term investment that’ll work once in a week or 2. Should you consult with your partner before making a purchase? It all depends on your preference and what you think her personality demands. If she’s the fun type, we think it’ll do you good to spice things up a little by surprising her. But in the case that she’s very open to your ideas and doesn’t necessarily fancy surprises, then you should talk to her. About 61% of men talk to their partners before buying an engagement ring so don’t think it’s anything new nor bad. If you have her opinion on things, you should be able to get her the perfect ring. Which alternative do I consider other than a flower piece? For one, snake rings are nice options to consider. Likewise, the solitaire is still a hit nowadays and is worth a look if you’re willing. Why is the ring finger favored? Vena amoris means vein of love and traditionally, it’s known as the vein that runs directly from the heart to the fourth finger on your left hand. 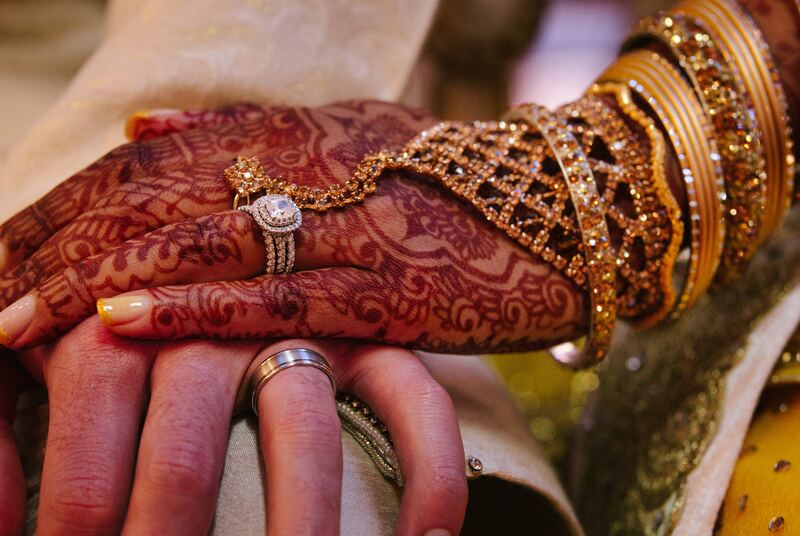 This is the main reason why it’s the preferred engagement/wedding finger by various individuals all over the world. What comes after the wedding ring? After the wedding ring, you go for the anniversary ring. This can be in the next 5, 10, 15, till 55 years. 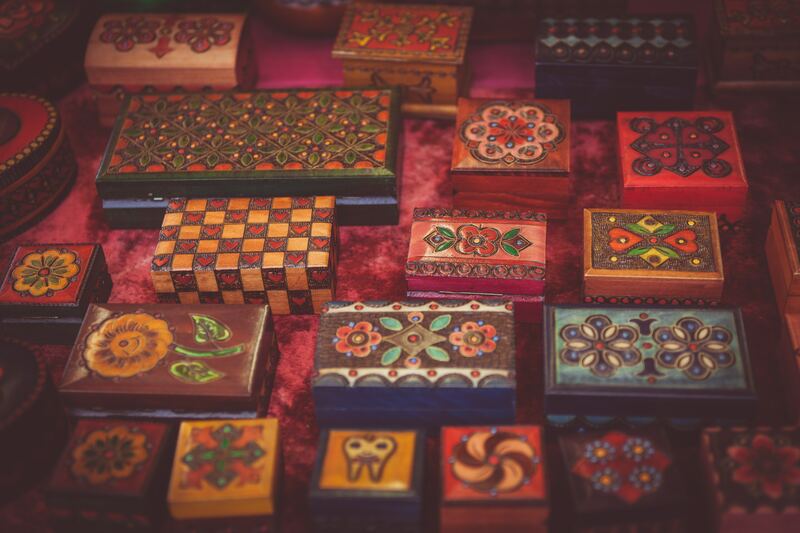 Each one, with different gifts for the sake of the love that’s being shared over the years. Nevertheless, while you can give your partner any gift, most people go for diamond rings to renew the vows. But you can go for something else. Pick items (jewelry, clothes, etc) that she’ll use and appreciate. Is there an engagement season? Yes, there’s actually a season for engagement. Though, it’s a local thing. The engagement season is a thing in the US and it marks the period that there’s a huge increase in engagements. This occurs during Thanksgiving and it goes down from November up to February. Still, there’s still another season which pretty much applies to every part of the world. From December to January, there’s the deep embrace of love, peace, and joy all over the world. People at this period will be happy and it creates the perfect moment for a proposal. To that, we would like to take a guess. We think this is why you’re reading this right now. Happy Hunting!